Original story published by Josh Bollinger here. EASTON — When it comes to breeding a new generation of environmental stewards, it’s important to start them early, said Maryland Department of the Environment Secretary Ben Grumbles on Wednesday, July 27. 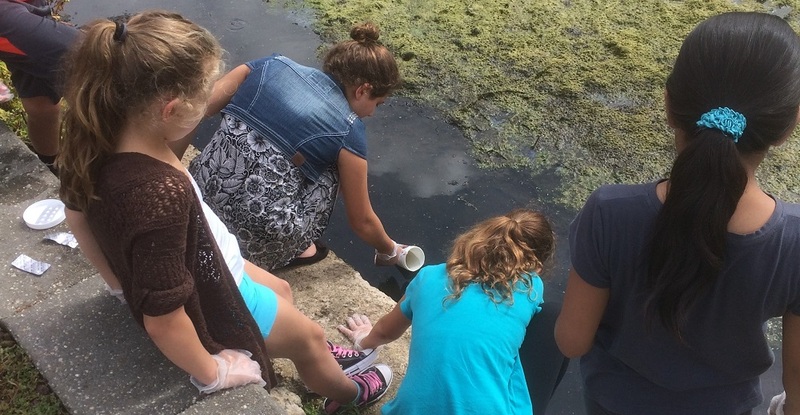 Grumbles was at Pickering Creek Audubon Center on Wednesday to run through water quality tests with campers in the center’s summer EcoCamp — a camp designed to get kids out in nature, learn about ecology and science and get in tune with their local environment. The campers — a mix of children between kindergarten and fourth grade — tested water samples collected from Pickering Creek for temperature, pH balance, turbidity and dissolved oxygen. Grumbles took the time to explain what each test meant and why the four tests give a good snapshot of water quality. Overall, the samples collected from Pickering Creek show the sampling spot in the creek has good water quality. The data collected on Wednesday will go to EarthEco World Water Monitoring Challenge, where 1.4 million people around the world test their local waters for cleanliness and share the results online among 140 countries, putting an emphasis on the importance of getting involved and protecting the local watershed, Grumbles said. Grumbles told the kids that it is important to test their local waters frequently and that it is one of the more important ways the campers and their families can help keep Maryland’s environment clean. That way, over time, they can see if the water is getting cleaner or dirtier. Grumbles said getting kids and adults connected to their watershed —environmental education —is one of the core principles of the state’s strategy for pollution prevention. At Pickering Creek Audubon Center and EcoCamp, the kids are learning about or connecting with nature every day, whether it’s by exploring the property or through various activities the camp provides. EcoCamp runs for six weeks each summer, with different themes each week. While the center does offer activities and classes during the school year, Director Mark Scallion said summer affords the camp the opportunity to keep the kids learning about nature all day long. “The theory is that they’re out here learning but they’re having fun at the same time, so they don’t really know they’re actually learning,” Scallion said. Activities during the summer include things like canoeing, dip netting for creatures, learning about ecosystems and various habitats, exploring and interacting with nature, and there’s also a thrust toward connecting the kids with the science of it all. While not all graduates of the camp move on to environmental careers, Scallion said a difference can be seen in the kids’ connection and understanding of nature from when they first start the camp to the end.